How do I connect and disconnect my Gear 360 from my mobile device? Once you have installed the Gear 360 app and paired your Mobile Device and Gear 360, they should connect automatically. 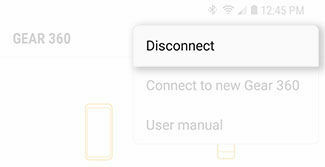 In rare instances where the automatic connection does not take place, you can manually connect your devices. 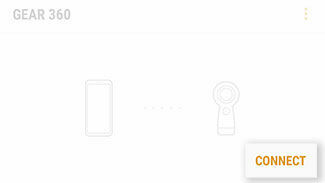 Note: Connect your mobile device and Gear 360 to access all of the available features and functions. Disconnect your mobile device and Gear 360 to conserve battery life. 1. From the Home screen of your phone, navigate to Apps > Samsung Gear 360. 2. Touch More Options > Disconnect. 4. To reconnect your mobile device, touch CONNECT. Make sure Bluetooth is enabled on your mobile device. Gear 360 (2017): How I install the Cyberlink Action Director software? Gear 360 (2017): How do I connect my Samsung Gear 360 (SM-R210) to a PC?